Each of our horses is unique in personality, abilities, and training. While they are definitely individuals, they all share a gentle, loving nature. Many of them also share a history of having been rescued by the program. 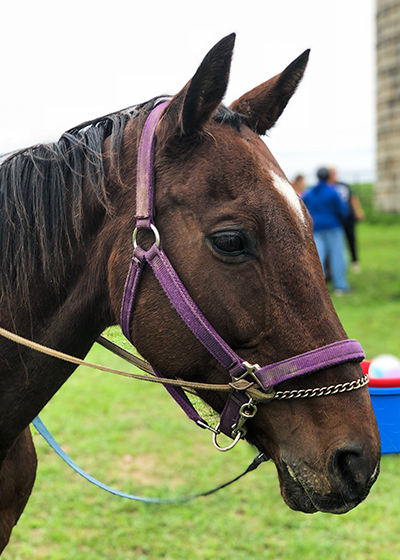 We think it is a beautiful thing that horses who have been rescued have the opportunity to bring so much joy and opportunity to people with disabilities. Please check out each of our horses and get to know them. We know you will love them as much as we do! Duke is our 20 year old grey Percheron gelding who has been with the program his entire life. His mother, Dinah, was one of our best therapy horses in her day, and Duke has certainly followed in her footsteps. In his prime, he was a tremendous lesson horse for riders of all abilities and ages, as well as a great trail horse. He is the definition of a gentle giant. Now nearing full retirement due to old age and some health concerns, Duke continues to be a fan favorite on our farm. Rocky and Molly are our two Haflinger ponies in our program. Rocky is the golden chestnut color typical of most Haflingers, while Molly is a more unique, darker color. 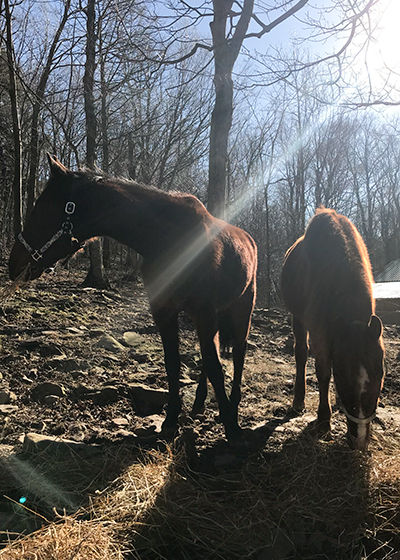 Rocky was rescued from a "horse dealer" who was going to send him to auction, and later, Molly was added as a package deal. 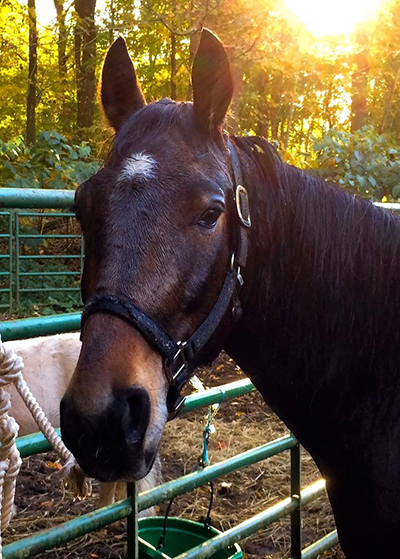 Both horses were bought sight unseen, but have since become two amazing therapy horses. 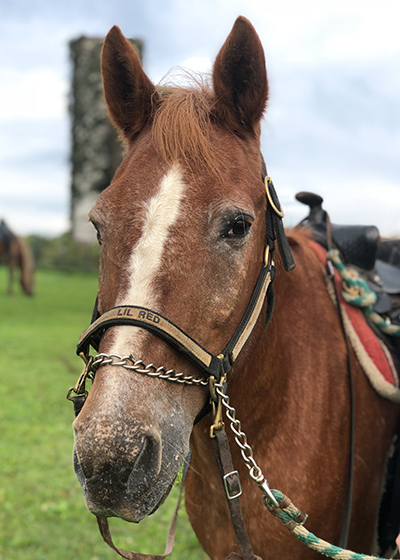 Rocky, in particular, is considered one of our best program horses, along with Duke and Red, as they are quiet and patient, and will put up with anything we throw at them. Blaze is our big goofy Belgian gelding. He's very destructive by nature; he broke our basketball hoop and knocked over our mailbox. In his younger days, this nature carried over to breaking fences and pushing around volunteers. As he's gotten older, he's matured well, and though he can still be pushy, he's much quieter than he used to be. With students, he's a blessing. Riders of all ages love to ride "the big guy," and we hope to have Blaze continuing to work in our program for years to come. Lil Red is an Appaloosa gelding in his late 20's. 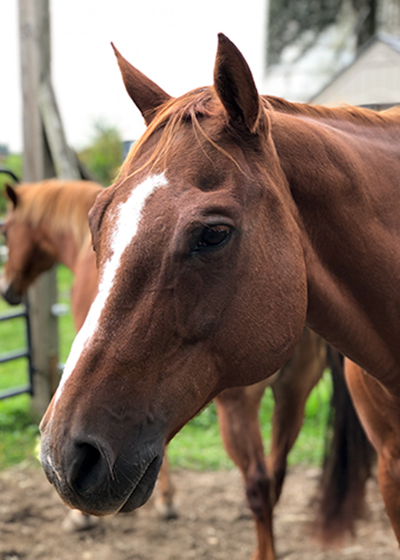 Prior to joining our program, Red was boarded at the stable that we were at before our current location, where his life consisted of living in the pasture and only coming in twice a day to eat. His owner never visited. Many of us wish that we could have had Red in the program back then, now that we see what a perfect fit for this life that he is. Red is truly "one in a million." For therapy classes, he's quiet, gentle, and easy to work with. He never spooks at anything. For giving riding lessons, he's the first horse that we think of to put newbies on. He'll listen to anyone riding him, from tiny little kids that kick too hard and pull at the reins, to the most experienced of adult riders. Starbucks is a solid bay Paint gelding. He used to be a polo pony, until an injury in one of his front legs hindered him from continuing his career. Starbucks has since become one of the core members of our therapy program. When he's not working, he certainly earns the "bucks" part of his name, carrying on in the field with his friends. He can be a bit of a handful sometimes, but for the therapy classes, he's a true gentleman who always take care of his students. Gracie is a bay Thoroughbred mare somewhere in her late 20's. At one point, she was a show horse, but has long since retired from that life. Now Gracie is quite content to work in our therapy program. Despite her Thoroughbred genes, she's one of our slowest horses, which helps to put young and new riders at ease when they're starting out. Nosey is our little "Mustang" mare. Nobody actually knows what breed she is, but we think she might have some gaited horse genes in her. Before coming to Best of Friends, she was owned by a veteran who shared Nosey's enthusiasm for cantering. Now, Nosey is learning to rein it in and slow it down to become a better therapy horse. 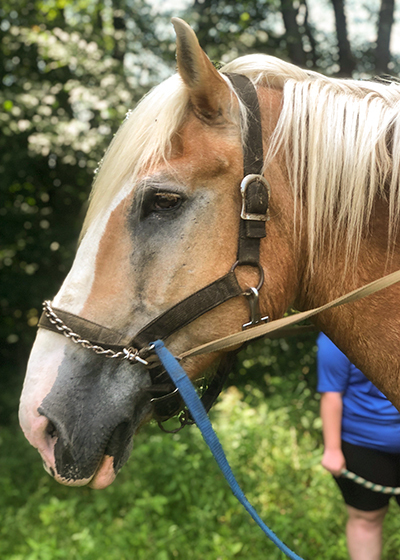 She's one of our youngest horses, as well as one of the soundest, so we hope she can continue to improve and become a reliable therapy horse for years to come. Fancy Face, aka "Boog," is a sorrel Quarter Horse mare. Like Gracie, Boog used to be a show horse, primarily showing in halter classes. Boog is the newest addition to our therapy program who just started to participate in our classes in the summer of 2018. 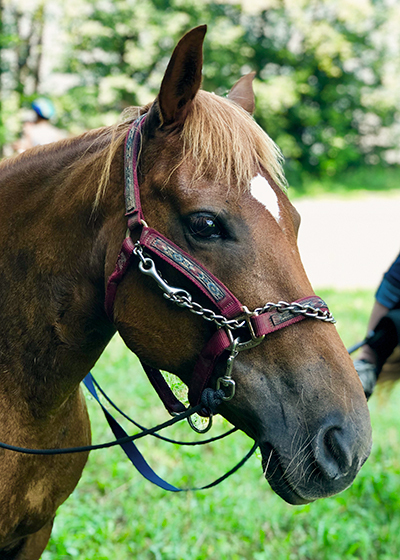 She does particularly well for giving lessons to independent riders, like our campers and volunteers. She also has a soft spot for blackberries, and will go nuts when volunteers pick them for her on trail rides! So far, Boog has proved to be an excellent therapy horse. We hope to see her continue to work in the program for many years to come. Dipsy is our smallest mare on the farm, standing somewhere around 13 hands high. She is believed to be a mixture of Arabian and Haflinger. Dipsy and our donkey, Elvis, were rescued at the same time, found wandering loose in Hooversville. 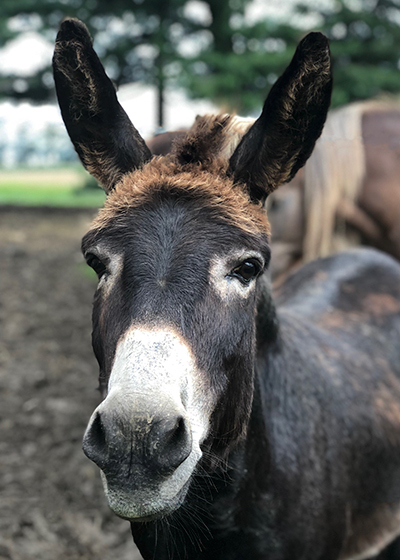 Now fully retired due to old age and some health concerns, Dipsy spends her days eating the treats her old students love to share with her, as well as watching classes go on from the pasture. 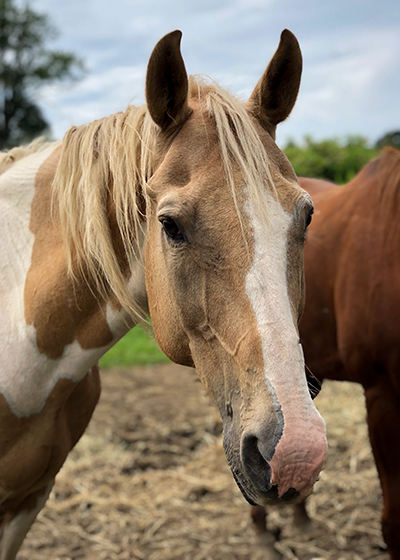 Gunner is a palomino Paint gelding. He is not a participating member of our therapy program as of yet, but he's working on it. He's one of the youngest horses on the farm, and he has a lot to learn and get used to before he becomes a therapy horse. In the meantime, he is a joy for some of our more experienced volunteers to ride. 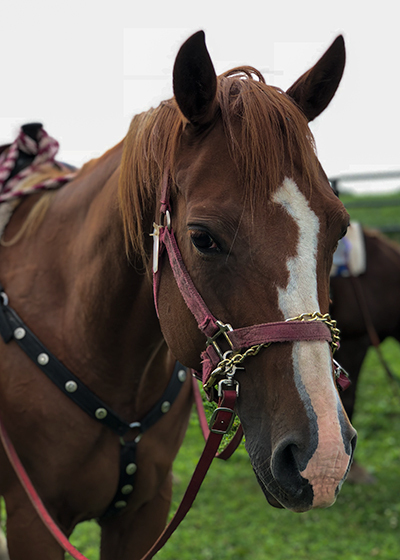 Prissy is a chestnut Quarter Horse mare who was donated to the program by one of our volunteers, Mandy. She is not used in the therapy program due to a progressive disease in her front feet that she has had since birth. Now, this condition leaves her mostly unrideable. Prissy is not a big fan of sweets; she prefers her treats to be in the shape of carrots and apples! She is now primarily a "pasture pet," like Elvis and Dipsy. Elvis is our little donkey pal. He's a bit of a trickster and escape artist; he knows just how to slip out of the pasture when other horses are being led in and out! Elvis spends a lot of time hanging out with Duke. Coincidentally, Duke's mother, Dinah, also spent most of her time with the resident donkey (who at the time, was a little jenny named Cranberry). Elvis LOVES all kinds of treats, and may even try to snag a few fingers along with them! He's not halter broke, and it's turned into a bit of a game as to who can get a halter on Elvis some days. 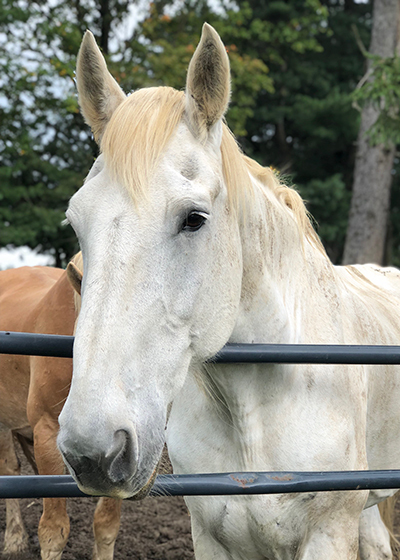 Lucky is a five-year-old "Percherpony" (nobody knows what breed he is, but he looks to have at least SOME Percheron in him). He is the youngest horse in the bunch. 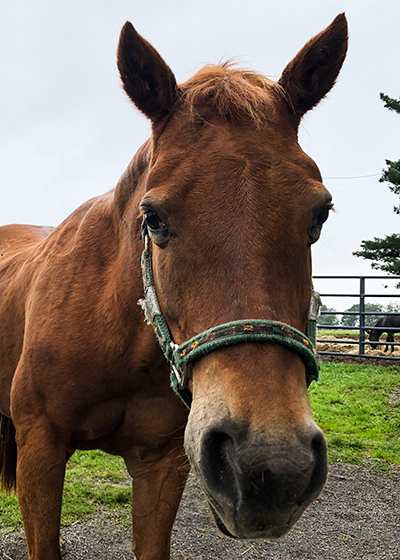 He was rescued by the program as a baby, and when he was four years old, one of our volunteers, Kate, started him under saddle, and has been training him ever since. Lucky and Lincoln, both new to Best of Friends, are our new pony ride horses at our summer fundraisers. So far, both young geldings have been a great addition to the program. 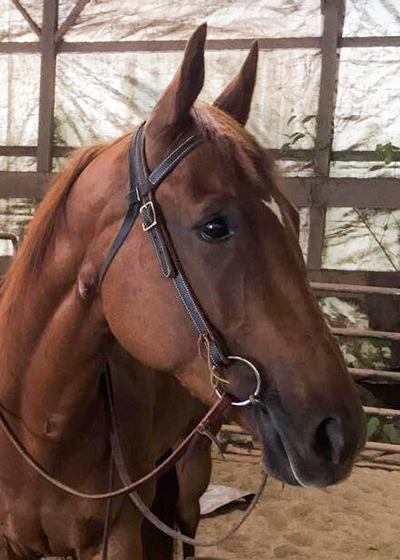 Jamaican Cruise, aka "Lincoln," is a six-year-old chestnut Appendix Quarter Horse gelding. Lincoln was born and raised on a local farm in Johnstown, and has just joined the program in 2018. He was quite the feisty colt growing up, but has since mellowed out into a more mature mind than body. Like Lucky, Lincoln is working as a pony ride horse for our summer fundraisers, and has proven himself very quiet and reliable in his work. Fun fact: Lincoln's great great great grandfather was Foolish Pleasure, the Kentucky Derby winner! 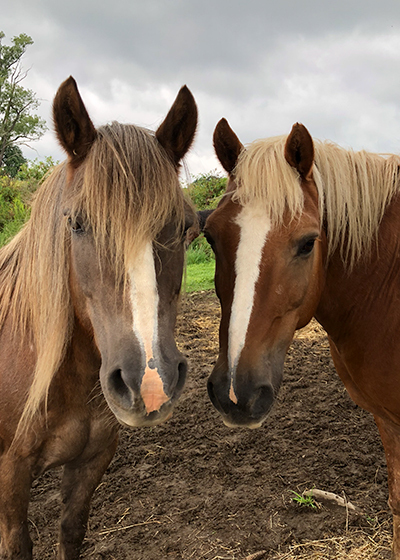 Jack and Zippy are two horses that came to us in 2017. They're essentially joined at the hip: you can never have one without the other! Zippy is a sorrel Quarter Horse mare, who was born and raised at a local stable. With time and training, she could potentially join the therapy program. 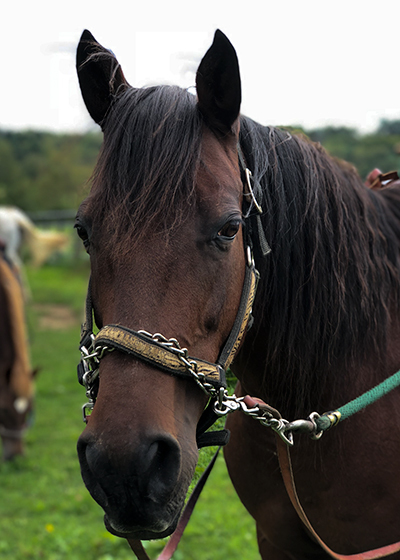 Jack is a bay Standardbred gelding who was an Amish cart horse. Jack has some physical limitations that prevent him from working for long periods of time; but, we hope to be able to give some of our students the opportunity to ride in the cart. 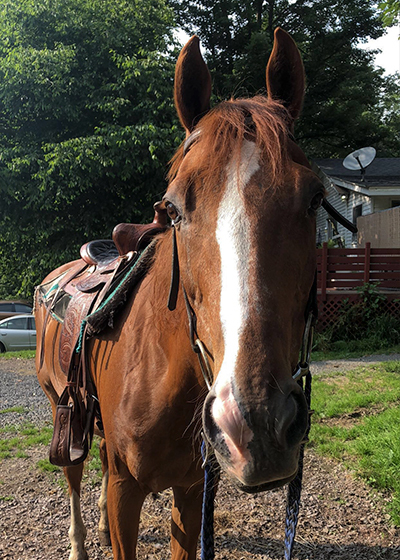 Bomber is a chestnut Quarter Horse gelding. He is Zippy's half brother; they were both born and raised on the same farm. His nickname is "Uncle Bomb" because he's such a perfect beginner horse. Bomber loves to work, and he's particularly fond of trail rides! He's the newest addition to the Best of Friends crew, and we hope to be able to introduce him to the therapy program soon! 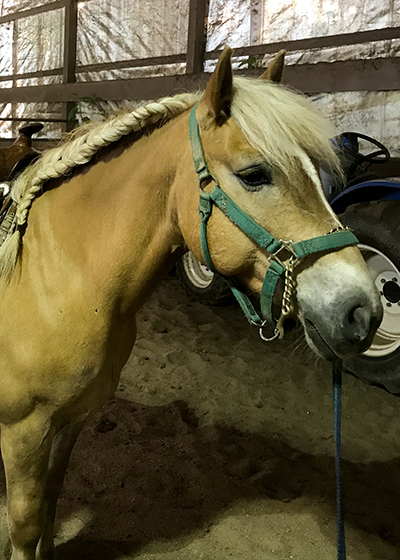 Sandy is a Haflinger mare who came to came to the program in 2014. Like Jack, Sandy was also an Amish cart horse. Currently, Sandy is primarily used as a trail horse; but, as she gets more training, we hope to one day involve her in our therapy program. Sandy is a very independent little mare; she'd much rather spend time by herself than in a herd. She adores treats of all kinds, but her favorite is pears! Best of Friends is a non-profit, 501(c)3 corporation.